The solenoid directional valve WK10J-01 is a direct-acting, spool type valve. Therefore, when it has no more energy, the valve allows flow from ports 2 and 4 to port 1. It also blocks flow at port 3. When the solenoid coil S1 has energy, there is free flow through the valve from port 3 to 4 and from port 2 to 1. 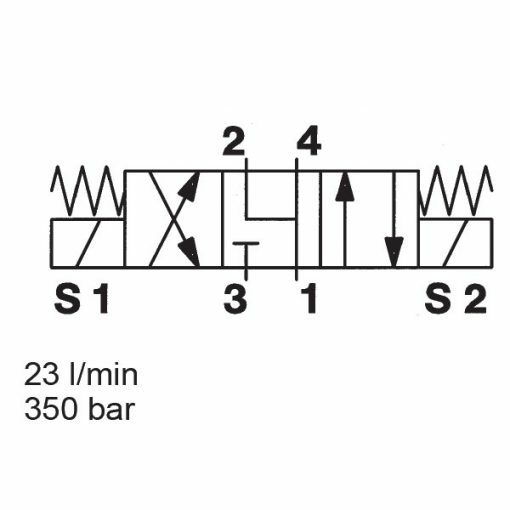 When the solenoid coil S2 has energy, there is free flow through the valve from port 3 to 2 and from port 4 to 1.